This is a very old misconception which has produced a lot of badly-behaved puppies! If you wait until 6 months, not only will you have missed the key socialisation and imprinting period in young puppies but you will also have allowed many bad habits to form which may be very hard to change later on. It will also be a shock to your dog to suddenly have you enforce strict training rules when she was previously allowed to run riot. In fact, young puppies are like sponges and absorb training with incredible speed and success. Guide Dog puppies have been known to start learning commands from as young as 6 weeks! The best time to start training your puppy is from the day you bring her home. Start with simple commands, such as Sit and Down – your puppy does not have to perform them perfectly but it important that she starts to get used to the idea of following commands and tries to please you. Teach your puppy everything she needs to know to behave well in your household – don’t allow her to do something now which she will later be reprimanded for. This is very confusing and unfair to the dog. If she is not allowed to enter the kitchen, start teaching the “Out” command from Day 1 and reinforce this constantly with rewards and praise when she does the right thing. Training should be fun and a part of everyday life, not a once-a-week dreaded boot camp! Dogs cannot concentrate for long periods and all training periods should be kept short and fun – you will have much more success with several short 5 minute sessions every day than a long one-hour marathon training session once a week. In addition, training always works better when it is incorporated into daily life activities, rather than done in isolation – for example, asking your dog to perform a command (eg, Sit, Down, Come, Stay) before being rewarded with his dinner, bowl, a walk, a play session or even a cuddle – means that you can incorporate training as part of your daily routine and it will not seem like a huge chore. While it is important to show your dog that you are the pack leader, you will not earn respect by using physical means to dominate him, such as “alpha rolls” and shaking your dog by the scruff of his neck or even beating him. In fact, you might damage the bond of trust between you and cause your dog to become fearful of you – or even to start using aggression against you. The best way to show your dog “who’s boss” is by consistent, firm leadership and by asking your dog to earn rewards from you. In order to do this, you must control the resources (eg, food, bed, toy) and ask your dog to ‘work’ for these resources by obeying your commands and performing certain exercises. This can be as simple as performing a nice Sit before being allowed out the front door for a walk or responding to a Come command in order to get dinner. By doing this consistently, the dog will view you as the pack leader and accept your authority over him. The saying: “you can’t teach an old dog new tricks” – is actually wrong. You CAN teach an old dog new tricks – it may just take a bit more time and effort, especially if the dog has to unlearn bad habits which have been formed for several years. Old dogs have just as much capacity to learn as young puppies, as long as you understand what motivates them and how to encourage them. Many people believe that dogs should just obey out of a desire to please their owners. However, while most dogs are keen to please their owners, it is unfair to expect to work without any rewards. Think about it – would you go to work if your boss wasn’t paying you, however much you loved your job? Using treats is not bribing your dog but rather rewarding him and encouraging him to repeat good behaviour in the future. Contrary to popular belief, you do not have to use a loud, “scary” voice to command your dog – this is more likely to make the dog believe he is in trouble and may cause him to act even more hesitantly as he is unsure of your mood and scared to anger you further. It is much more effective to use a cheerful, up-beat tone when giving commands to encourage your dog to want to please you. Many people believe that certain breeds are completely untrainable but this is untrue. Yes, certain breeds may be harder to train due to their breed characteristics (eg. many scent hounds are easily distracted by smells and may become so engrossed that they seem “deaf” to commands; many sight hounds have a chase reflex and therefore find it hard to stop running and respond to a Recall when they are chasing something) - but this simply means that you may have to put in a bit more time, patience and effort and that you may need to search for alternative training methods. 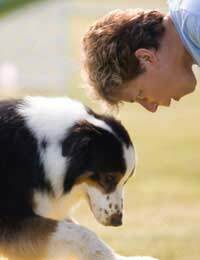 Good, experienced dog trainers will have many different ways to motivate and train these so-called “difficult” breeds. On the contrary, play is very beneficial to training and it should be incorporated as part of training – for example, by turning training exercises into a game or by rewarding the dog with an exciting game with his favourite toy, instead of a food treat. Many of the world’s top dog roles, such as airport detector dogs, are trained through play – they believe that their search for illegal substances is simply one big game and that is why they perform their duties so enthusiastically. Unless you are a very experienced dog trainer, it can often be hard to achieve good results by yourself at home. You will benefit greatly from the guidance of a good, experienced dog trainer and also from the input of other dog owners in a similar situation. Even if you are able to train your dog well at home, training classes have many advantages – such as providing your dog with important socialisation with other dogs and teaching your dog to respond to you even when there are distractions. Many people have dogs that are well-behaved at home but a complete hooligan when out – this is because they have not extended their training to places with distractions. Just as humans need more than kindergarten to be prepared for life in our modern world, so dogs need much more than just 8 weeks of puppy classes. Puppy class merely sets the foundation – most dogs need at least another course of adult classes and ideally, refresher classes throughout their lives as well as continual training at home as part of its daily routine. This does not need to be fancy but just reminding the dog of his “manners” every now and then. Dogs are also much happier when they continue to receive training because they continue to receive mental stimulation and challenges to work towards.